A pet as part of the family can be a wonderful thing. Pets can help bring comfort and companionship to your family, and teach empathy and responsibility. Consider this fact: Petting animals can lower blood pressure. Think about what that can do when your child is anxious about homework or a test the next day. If you’re thinking about bringing a pet into your home and you have kids, it can be one of the best decisions you’ve ever made. Pets can make wonderful companions and sympathetic listeners. But before you decide on a pet, first do your homework about appropriate pets and base your decision on a handful of factors. No matter what your kids tell you, you should understand that you, the adult, will ultimately be responsible for caring for a pet in your home. Consider the amount of time you want to spend tending to your pet. There is a big difference between caring for a pet rat and caring for a pet dog. Infants – This age group cannot handle or care for pets. If you already have a pet and then welcome an infant into your home, be sure to introduce the two, and supervise them as they get to know each other. Toddlers – Sometimes it seems like toddlers have four hands! They love to pull the fur, tails and ears of pets because they’re curious and love to explore. Be sure the pet you bring into your home can handle this type of attention, and be sure to supervise your child as he or she interacts with your pet. Also, keep your child from getting into the pet’s food, litter box or the water of an aquarium. 3-5 Years – This is the age when kids learn about contact and empathy, and they can begin to help care for the pet in simple ways (think pouring a scoop of food into a dish). 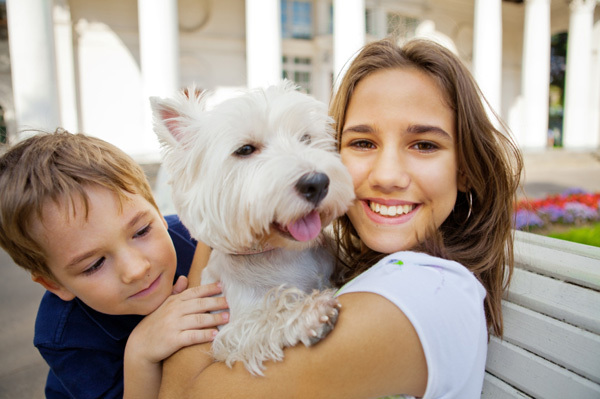 5-10 Years – Small pets might be best for this age group. Kids can begin helping a bit more and you can also teach them about good hygiene, like the importance of washing their hands when finished playing with their pet. 10-13 Years – Think dogs, cats and rabbits for kids at this point in time. This is the time when kids have a good understanding of responsibility and can help walk and feed pets and clean out their cages or living areas. It’s also a great age for kids to participate in things like dog training classes to form a good basis of understanding. 14-17 Years – Teenage years pull kids in many directions and keep them busy. Consider a bird or fish at this age, as these types of pets need less care. If you bring a dog or cat into your home at this point, the pet more than likely will be living with you, not your child, for years to come (think of kids heading off to college or to live on their own). There is no one pet that is perfectly safe for kids. Dogs and cats can trigger allergies (although studies show that if you bring a baby into a home that already has a cat, the chance of developing allergies may be reduced), sometimes bite and scratch and also can carry infections. These pets are just considered better options than others. Be sure you always supervise your children and pets and their interactions. No matter what type of pet you decide to bring into your home, do your homework first. Consider the type of animal, where you’re getting it, the care it will need and the age-appropriateness of your child before your open your home to a new pet. Don’t forget to find out about the types of infections different pets can carry and how they can be prevented. Pets can provide a great permanent source of the warm-and-fuzzies. Before deciding on a pet, be sure you and your family are ready, willing and able to care for them.